Cross-country hike up exposed alluvial fan followed by a moderately easy canyon hike. There is no trail to Little Bridge Canyon and no marked parking area. 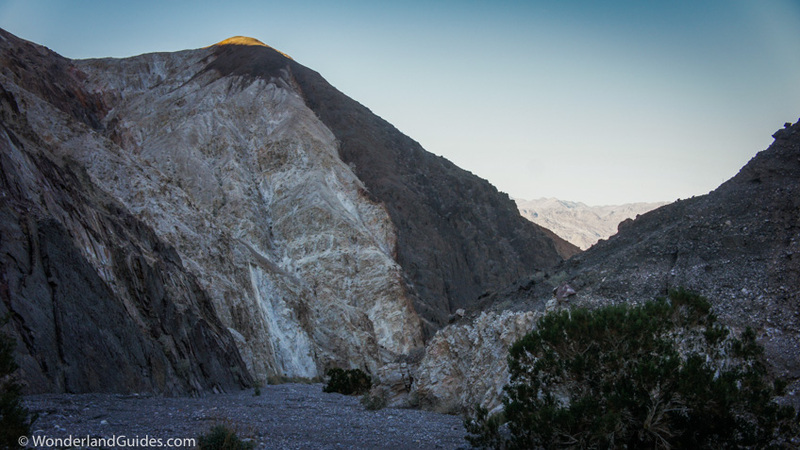 The most popular place to park is on the shoulder of Highway 190, about 3.1 miles east of Stovepipe Wells (4.1 miles west of Scotty's Castle Road). The coordinates are N36° 36.109' W117° 05.634'. 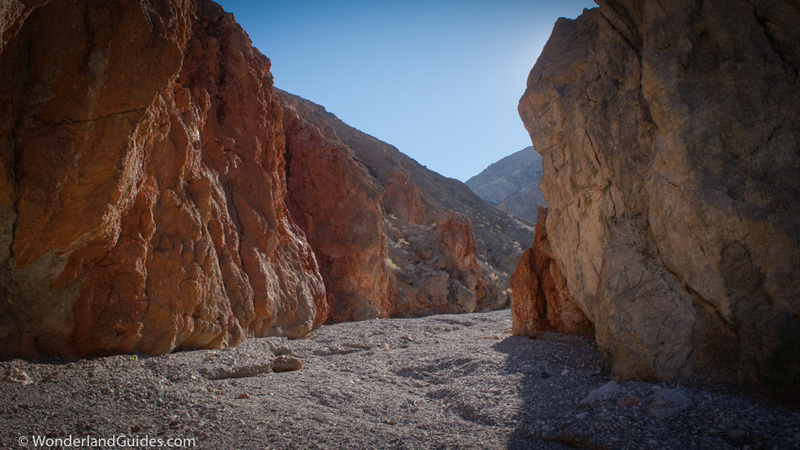 This hike is on the northeastern corner of the Panamint Mountains, and delves into the depths of the base of Tucki Mountain. 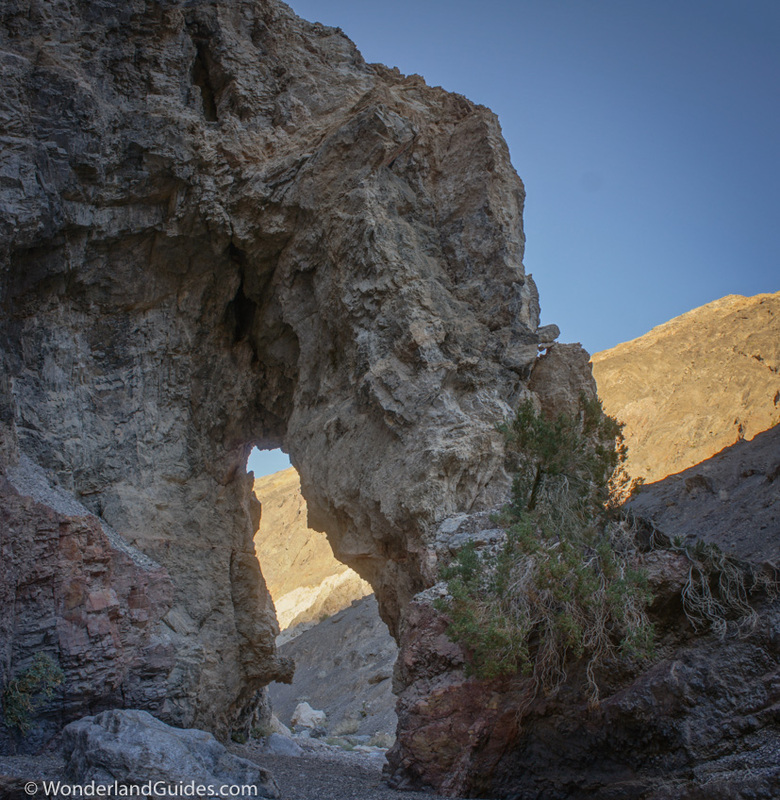 This is a good hike to bring a GPS or to practice your map and compass skills as the canyon mouth is 2 miles from the road and difficult to find by site alone if you have never been there. There are several opportunities on the way up to go wandering in to the wrong canyon. 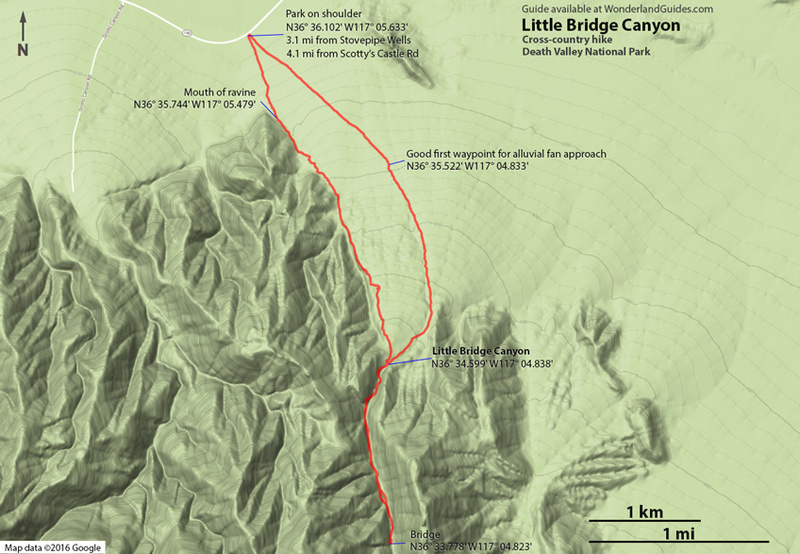 GPS track of hike to Little Bridge Canyon. The westernmost track marks our hike up through the more difficult route of the ravine. The trip back is down the alluvial fan and initially swings further east than necessary. This hike is moderately difficult. There is no trail, but there are two general routes to the canyon from the described parking location. The most common route is up an alluvial fan and the second and more difficult approach is up the ravine. The terrain is easy and the vegetation is sparse. The hike is a steady climb from about 27 feet below sea level to about 1,824 feet over 3.3 miles. With a few ups and downs, the total climb is a little over 1,900 feet. Elevation profile of hike up the ravine to the rock arch in Little Bridge Canyon and then back down across the alluvial fan. This is the easier route. It offers good views of the nearby Death Valley Sand Dunes. From the parking location at N36° 36.109' W117° 05.634', set a course for N36° 35.522' W117° 04.833'. 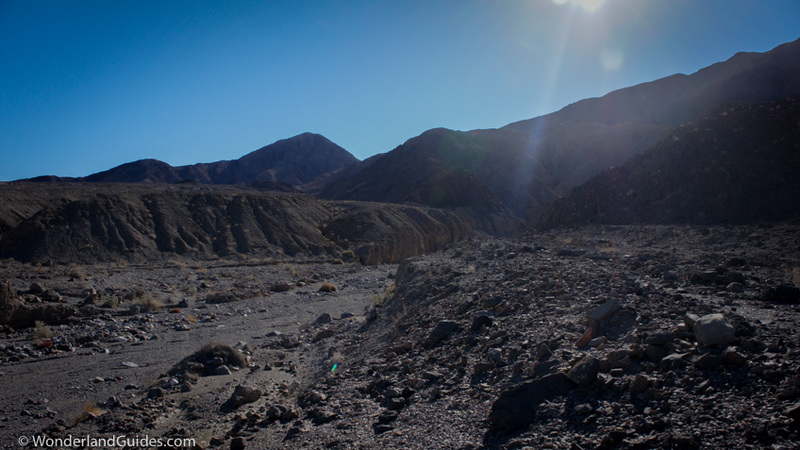 This first waypoint takes you out onto the alluvial fan far enough to avoid some of the rougher terrain. From here it is a straight shot to the canyon mouth at N36° 34.599' W117° 04.838'. Once you are in the canyon the path is obvious. For a more challenging hike you can follow a small series of ravines much of the way. From the parking location at N36° 36.109' W117° 05.634', set a course for the ravine mouth at N36° 35.744' W117° 05.479'. Follow this ravine until it climbs back to the surface of the fan. Here you can drop into a second ravine. Go left at the nearby fork and follow this until the path is blocked by the dry falls. From here look for small cairns on the left which mark a route out of the ravine. Follow the canyon along the rim (but stay back from the crumbling edges) to the mouth of Little Bridge Canyon at N36° 34.599' W117° 04.838'. Little Bridge Canyon begins as a narrow opening in the side of Tucki Mountain. After a short distance through some narrows, the canyon opens up and passes by the stark white Eureka quartzite formation. It has been turned on its side here by folding. In his hiking guidebook (Amazon), Michel Digonnet offers a wonderful description of the geologic formations visible through this section. Eureka Quartzite formation in Little Bridge Canyon. Little Bridge is located roughly 1.2 miles up Little Bridge Canyon. It is a lovely arch formed of Eureka Quartzite. If you have more time and energy, you can explore the upper canyon beyond Little Bridge for another mile or so. The slot numerous slot canyons along the western wall offer additional exploration options.